Back in 1995 Edward Burns showed the world a little film that he produced, directed, and was also the lead actor. 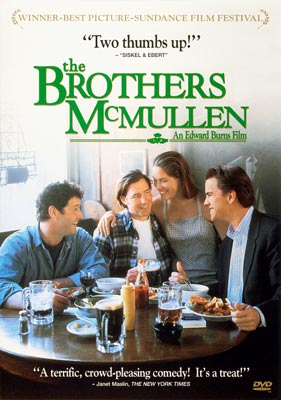 That little film, The Brothers McMullen, had a big impact on his career. It premiered at the Sundance Film Festival in January of ’95 and won the Grand Jury Prize. The $25,000. film was released later that summer and grossed over $10 million. And though he has gone on to earn big paychecks as an actor on large Hollywood films as varied as Saving Private Ryan and 27 Dresses, he’s never lost his desire to write and direct smaller pictures. Among the nine features he’s directed, in 2004 he made Looking for Kitty using a $3,500 Panasonic DVX 100 camera. In 2009 he made some Webisodes called The Lynch Pin using the Red Camera. One thing Burns has resisted doing is the Hollywood offers to direct big budget productions that he doesn’t have the heart to make. And just a couple weeks ago he released his latest smaller story, Nice Guy Johnny, that he pulled off making for $25,000. using a three man crew and just a ten day shooting schedule. The movie was released iTunes, Video on Demand, and Netflix. And Burns still owns the copyright to the film. Could this really be Hollywood 2.0? “My stuff is low concept. Usually character driven, and usually born out of a type of character I either know or come across that I get excited about exploring who they are, and a lot of times where they come from. So I try and look at environment, their community, their family, and they are mostly born out of that. Periodically I’ve tried to find a little bit of a plot just to drive the story forward in order to explore who these people are.”—That’s how Burns summed up the smaller stories he tells during a Q&A session at the Tribeca Film Festival this year. It’s a model that I think works in whatever unlikely place you find yourself writing screenplays. You can purchase the Nice Guy Johnny script with Burns’ notes at Amazon.